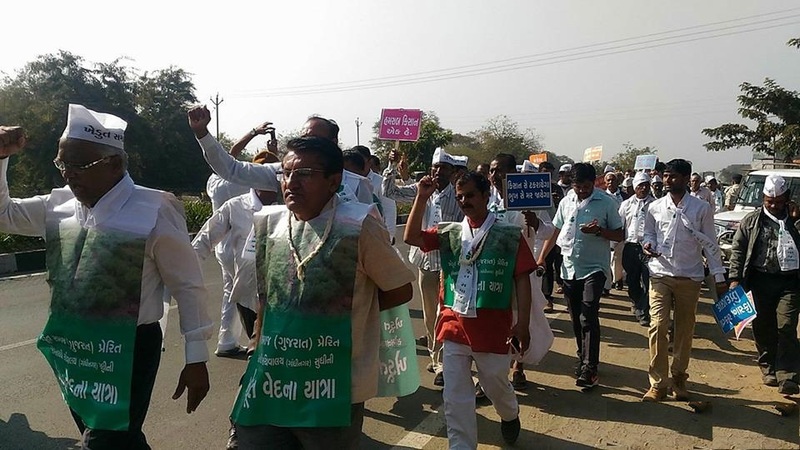 Have the farmers around Ahmedabad city realized that their nod to the Gujarat government proposal to turn their agricultural land into urban hotspots was a major mistake? It would seem so, if meetings held by Sagar Rabari of the Khedut Samaj-Gujarat (KSG) with the farmers of two of the villagers situated about 20 km from the city are any indication. Called “to help them better understand the implications of merger into Ahmedabad Urban Development Authority (AUDA)”, says Rabari, the village meetings at Vayana and Thol clearly suggested that people have begun to oppose AUDA seeking to take away their land in the name of urban development. A prosperous village, Thol is also known to be one of the biggest sweet water wetlands in Gujarat. It has declared a major birds sanctuary by the Gujarat government. Thanks to the Thol lake, there has never been any water shortage to the farmlands of the surrounding villages. It all began in 2009, when the Gujarat government, through a notification brought 68 villages (43 villages of Kalol and 25 from Ahmedabad and Gandhinagar talukas), with a total area of 625 sq km (62,500 hectares) into the AUDA boundary. The meeting saw farmers point towards how the merger into AUDA has made it difficult for the farmers, who had received their land from the government as part land reforms (and identified as “new tenure”) to sell it – as they cannot obtain no-objection certificates from the panchayati raj institutions, which have been made defunct. While there has been sharp appreciation in the value of their land due to increased jantri rates, the farmers said, those with a large amount of new tenure land have had to endure a major financial blow. Meanwhile, wealth tax and electricity bills have gone up. Village residential area has been limited and future expansion will be difficult. Rabari further says, there is also the fear that, if town planning schemes of AUDA get implemented, the farmers would lose 40% of their land. Worse, the village grazing land or the gochar – often identified as wasteland -- would be automatically claimed by AUDA and their dairying profession would be adversely hit. Rabari says, with plans to hold more such meetings with other villages, KSG would succeed in mobilizing the farmers around Ahmedabad, claiming similar successes against urban authorities of several other Gujarat cities – Surat, Vadodara, Rajkot, Jamnagar, Junagardh, Gandhinagar, and other cities, also against the Mandal-Bhecharji special investment region (SIR) in North Gujarat, and Olpad SIR and Hazira SIR in South Gujarat.